Coming off of Tuesday’s beat down at Sheffield I think we all can be excused with applying more focus to the competitions that matter. The League Cup for me is like the Community Shield – looks great in a case but I’d trade it in a moment for the Premier League or Champions League. It just isn’t something I tend to be concerned with from a results standpoint. So I think we can rightfully take a break from the grind and take a look at where we are 10 games into the Premier League season. With a little more than a quarter of the Premier League in the books it remains early to project what the table will look like in May, but the numbers are starting to give us an idea of what the teams will look like for the near future. After a mediocre start Arsenal has fought their way up to 2nd in the standings with their defeats coming from an opening day stinker against West Ham and a loss against Chelsea that will live on in infamy thanks to Mike Dean and to a lesser degree Diego Costa. Looking at the stats Arsenal as a team look similar to prior years offensively. The team’s possession rate remains consistently one of the top 2 or 3 in the EPL on a weekly basis which is expected. Also holding to the numbers Arsenal has completed a higher % of passes than any team in the EPL and only trail Manchester United overall. While those 3 teams are at the top of the table the next two are currently disappointing with Swansea 12th and Chelsea 15th in the table. As with most stats in the EPL being at the top in one isn’t enough to get the job done. Where Arsenal has been delightfully different in 2015/16 has been at the back where they seem to have discovered a combination of midfield and defense that flummox opposing forwards and mids. The midfield has been corralled effectively by Santi Cazorla in one segment and Francis Coquelin in another very different spot. Thru the first 10 games of the season Santi Cazorla has completed 750 successful passes, which is a tidy sum, but even more impressive when considering the next highest total is Cesc Fabregas with 620. As an added bonus Cazorla’s success ratio is over 90% - meaning not only is he making a lot of passes, he’s doing so without giving the ball away. Looking at the top 10 for successful passes gives an insight into how Arsenal is dictating play from end to end. Cazorla’s linkage to the front, primarily Ramsey and Ozil, is leading to a further successful pass on most equations. Arsenal is often criticized for making the extra pass too often. There’s an emphasis on passing, but largely it’s the avenue the team scores by even when playing off the counter attack. Playing 2 players in a defensive mid pairing has been one of the more intriguing concepts employed by a manager in the EPL this year. Aside from a heavy midfield reliance for moving the ball Wenger has a history of shifting around portions of the formation and this is an example of utilizing one player in a new position, but one that fits in Cazorla and then that new founds strength bringing out the best in another player in Coquelin. Coquelin is one of two players, along with Idrissa Gueye, who rank in the top 10 of Mids for Interceptions, Dribbles Against, and Tackles. Gueye is the unfortunate beneficiary of playing with an overall undertalented Aston Villa and suffered thru the Tim Sherwood experience at the start of the season. Coquelin’s value will always be a player who doesn’t do any one thing as a defensive midfielder better than everyone else, but he will be a player who does every part of his job in combination. Looking at the list the clamoring for a defensive midfielder that Wenger heard over the offseason is nonsense. Arsenal just signed an extension with a defensive midfielder who is performing as one of the top 3 in the EPL and is under 25. The desire to pick up Wanyama or Schneiderlin in the offseason made little sense as it would have resulted in either a need to transfer Coquelin, straight after his extension or it would have meant a rotation strategy with players who desperately desire to play in the first team. Simply put that isn’t how the transfer market works nor how any team operates with their defensive midfielders. Those that suggest otherwise are the same that float theories about signing Benzema, Ronaldo, Cavanni, et al. These are the same who would have busted down doors to sign Mario Balotelli or Falcao. Flamini/Arteta are the types of players who fit well into the role of backup to a Coquelin type. It would be wonderful if they consulted with one another on when to get hurt, when to be healthy, and when to be on top form but reality is constructing a team is an exercise in compromise. Arsenal’s top defenders have been one of the tops in the EPL currently tied with 3 others for least goals allowed. Granting that defense is, at the end, entirely about not allowing goals that’s mission accomplished thru a quarter of the season. As it stands the team’s aerial performance has been largely that they haven’t needed an aerial challenge at the back. Part of the rational is because crossing has become markedly more difficult with Monreal and Bellerin patrolling the wings. Also playing a role is interceptions. The current EPL leader in interceptions at the back is one Laurent Koscielny. Also on that list is Nacho Monreal who has emerged as a top fullback at a relatively advanced age. Looking at the other leaders the Aston Villa duo is proof that interceptions occasionally occur because you’re allowing attempts in mass. The only other team with 2 at the top are Tottenham who, begrudgingly, I will point to as an example of another solid defense in the EPL. With regards to dribbles – again the deep spacing of Arsenal has prevented goals but also reduced statistical collection. A successful dribble against Arsenal usually leads to another defender picking up the slack or because it is so deep Cech has cleaned up the mess. At the moment the attacking part of Arsenal’s game is somewhat in tatters. With Ramsey, Wilshere, Rosicky, Oxlade Chamberlain, Walcott, and Welbeck off the pitch. You could point to it as an indictment of the transfer dealings and you wouldn’t be wrong. Knowing that Rosicky, Wilshere and Welbeck were likely to miss some time during the window the team’s lack of signing any depth up front could bite them at the most difficult phase of the season. Nevertheless Arsenal’s up front has been effective after a slow start. Mesut Ozil is the type of player who occasionally infuriates, but there are two things that occur without proper credit. 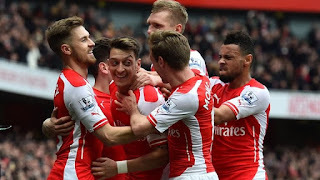 Ozil tends to see plays that most players, including his teammates, don’t see. That means for every brilliant setup to a Giroud header we see there’s the brilliant setup that gets missed or the run that, had it been taken, would have been in position to receive Ozil’s apparent pass to no one. With all that said it isn’t particularly shocking that Ozil ranks first in the EPL in assists and in key passes. For the full Ozil to be recognized in a game requires teammates to show up. He will likely never be more than a slight liability in getting back on defense, but when he’s on full song he is very much worth the team’s investment. Aaron Ramsey typically plays a non-forward position compared to Alexis’s prevalence to swoop from the wing. It’s not a position that he’s comfortable with and the stats back up that he’s a mix of good and bad in the role. Amongst players in similar roles, those being central and non-attacking wing central midfielders Ramsey has been an effective passer, right around the level of overall passing that Ozil has achieved. That said the rest of the story is a mixed bag. Ramsey’s role in the offense has been to facilitate the facilitators and most goals he’s been involved in don’t show an assist for him because of his roll being in the build up and not the finishing. More disturbing is his stats elsewhere are relatively poor. No player near the top has been dispossessed as many times as Ramsey with a rate almost double of those players in the same passing range. In addition his bad touch ratio is high, which plagues Ozil as well. This has become somewhat a team issue over the last few seasons as the team’s high number of passes as opposed to holding possession leads to a greater degree of turnovers. With him currently on the shelf it would have been an excellent time for Oxlade Chamberlain to show growth in the position but with him also injured it leaves a tremendous hole on one side of the offense. I’ve no idea who will fill in the role but if someone does grab the spot and runs with it – I think Ramsey’s Arsenal future will be in serious doubt as they seek to prevent too many Gibbs/Debuchy situations from occurring. 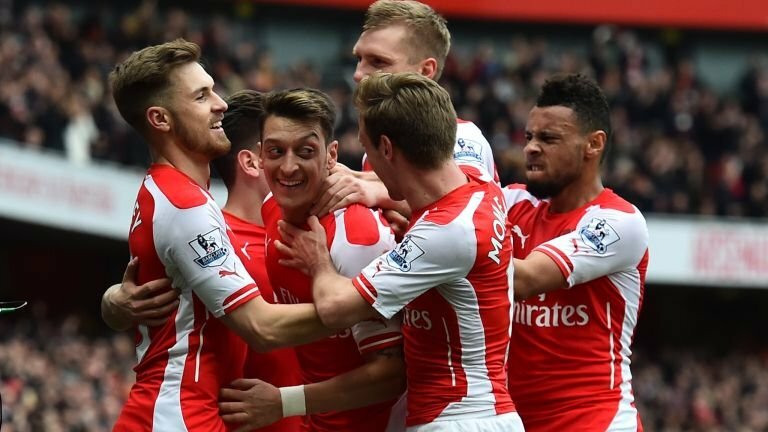 Arsene Wenger’s offense has been something different than what we normally see in the EPL. Despite the team’s alignment being, on the surface, a 4-2-3-1 the reality is Alexis plays a heavy role in partnering with the 1 at the tip of the spear while Ramsey/Ox on the other side are more focused on the build-up. The forward position is also handled in a unique manner with 2 players who rarely overlap playing almost equal minutes in Olivier Giroud and Theo Walcott. Those who have talked with me recently know that I have a dastardly unholy plan to play god and combine them into a single well rounded striker I refer to as Thelivier Walroud. For the purposes of analytics I’ve exercised this plan and it provides a fairly accurate assessment of Arsenal’s strike force. There are a few outliers but for the most part what one should expect is about an 11-15% conversion rate of shots from their primary scorers. Arsenal’s attack team shows up as one of the most varied in the EPL with Sanchez, Giroud, and Walcott all putting multiple goals in, but with an interesting range. Much has been said about Walcott growing into the role of a true forward this year, but if you look closer there are still issues. His offside rate is one of the highest and his ratio of goals to shots is fairly poor. The sample size is too low to make a call based on the data, but if you’re watching the games every week the eye test and stat test align. Walcott’s pace opens a lot of doors but for some reason his ability to get behind the ball is lacking. The stereotypical Walcott goal involves a short breakaway followed by a shot towards the net with speed measurable with a sun dial. The pregnant pause as supporters wait for Walcott’s ball to get to the goal line is astounding and a clear limitation of his game currently. There’s an incompleteness that is filled by his counterpart Giroud. Giroud’s pace is largely pedestrian in nature but looking at the things Walcott struggles with, Giroud excels. He’s above average on headers in both his box and the opposition, he gets back on defense better than most forwards, he’s a bull in a china shop off of set pieces finding all sorts of ways to direct the ball on net, and he’s not afraid to occasionally dazzle with an in box lightning striker. The things he does well – Theo doesn’t and what Theo does well Giroud does not. Combine them together and you have one of the top scorers in the league with a reasonable goal ratio. Combine either player with Alexis and you effectively have one of the top 2 or 3 forward combinations in the league and one that has delivered far more shots than any other setup. It can be an aggressive look and it allows the team to create chances in bunches. 1. Nacho Monreal has become very high level – a player who has grabbed a spot and run with it. He’s near top of the fullbacks from a defensive standpoint. 2. Hector Bellerin’s eye test is more impressive than his stat test. He’s a little prone to lapses, but he’s a kid who has a tremendous career in front of him. Looking at valuations at the start of last year he was rated around $4mm of value. I wouldn’t sell him for $30mm today. 3. Aaron Ramsey is not having a strong season. Ramsey has looked good due to his passing, but he turns the ball over twice as much as similar players who have similar passing totals. He’s also been run past an inordinate number of times while being the defensive wing. He looks uncomfortable in the position on second viewings as well. 5. Mesut Ozil is a better player than we give him credit for. His chance and assist creation has gotten better with every multi-month period that he’s played for Arsenal. 6. Alexis’s high work rate hasn’t cut into his performance stat wise. Recent rumors had Real Madrid offering somewhere in the $50mm range along with Denis Cheryshev. If I’m Wenger I have zero interest in Cheryshev at all – a player who can only score 4 goals a year when made an option. He’s not a player I rate as worth anything at the moment. I don’t see this happening unless the number is commensurate with what top forward talent has gotten in recent years. For instance the option on Falcao at a similar age when he went on loan at Man U was approximately $75mm. I would much rather pay Alexis than take a check from Real. 7. Teams can stop Walcott with a deep defensive formation, but they can’t do the same with Giroud. Likewise playing a high line against Walcott is defensive suicide while very effective against Giroud. Plan accordingly. 8. Joel Campbell needs a run of games. With Ramsey, Ox, and Theo out the speculation is Kieran Gibbs will get a shot on the wing. I’m not opposed because he needs a chance to get back in the lineup as well, but Joel Campbell is in last shot territory for me and I think, as a club, Arsenal have been very poor at finding an opportunity for him to potentially become a player of value. 9. Our injury luck is insanely bad – We have 7 mid-forward players out of the lineup. The timing has been incredibly unlucky. 10. Arsenal didn’t need to spend in the offseason, but they should have picked up one player at almost any position and it would have helped the team. 1. Mourinho is losing his mind and his senses. Understanding that Jose has some very serious family matters with an ill aging parent I’m able to be sympathetic to the man while believing the manager isn’t capable of running his team at the moment. Eden Hazard has been labeled as one of a few scapegoats, but the reality is he’s performing in line with past seasons. There’s some loss, but a lot has to do with the team’s failures to have compatible players. I’ll never understand picking up Falcao for the year either. On the whole Chelsea as a team is bad right now, but player performance is coming down to ridiculously poor managerial performances. At the moment in order to have a reasonable shot at a Champions League berth Chelsea need 62 points from 28 games. That equates to an average of 2.15 a level that is just off title winning. Unless massive managerial changes are made there is little chance of that occurring. 2. Jaime Vardy has no chance of continuing his scoring run. Right now he’s scoring on 24% of his shots on goal – simply amazing, but long term unsustainable. Love to watch Leicester, but they will drop a few spots. 3. Stoke is better than I thought initially. Not markedly so but I was sure they were going to be in a relegation fight. More likely they finish around 11th/12th. 4. Newcastle and Sunderland are both embarrassing and Aston Villa is Tim Sherwood’s mess left for an adult to take care of. 5. The league is tighter as a whole as smaller clubs have seen higher transfer budgets take hold. West Ham, Leicester, and Crystal Palace are outperforming their metrics sizably to start the season and a lot of that is due to players they’ve recently purchased. They’re not spending $30-$40mm but when you can pick up Yohann Cabaye for around $15mm – it shows that the minnows can go out and get the types of quality players coming off a year where they’re a backup at a big club without much trouble. On the whole the quarter mark in EPL shows Arsenal in a fine position. Their UCL performance is the real black mark and so far as the League Cup goes – we knocked those that shall not be named out in glorious fashion. My complaints are few, the numbers are holding up and the Arsenal is a team that can certainly play at the top if they continue their performances from early in the season.